The minivan segment has been somewhat neglected in recent years in favor of sport utility vehicles, but the fact remains that if we have a large family with significant space requirements, a good old minivan is virtually essential. Take for example the all-new 2018 Honda Odyssey. On the market for a few months now, the new 2018 Honda Odyssey is offered from only $ 34,890 and offers everything a family could want from a modern minivan. Its engine delivers reassuring power while being fuel-efficient, and the new Odyssey also offers unprecedented features that we do not find on any other minivan. The new 2018 Honda Odyssey features a 3.5-liter V6 engine that develops 280 horsepower and 262 lb.-ft. of torque. This engine can be paired with a 9-speed automatic transmission or a 10-speed automatic transmission in the high-end Touring model. The engine of the new 2018 Honda Odyssey may be more powerful than it was in the past, but it is also more fuel-efficient thanks to these new gearboxes, but also thanks to the ECON driving mode which adjusts the parameters of the various mechanical components in order to favor fuel economy. The average fuel consumption rating of the new Odyssey is therefore more than reasonable with an average of 8.4 liters per 100 kilometers possible on the highway. 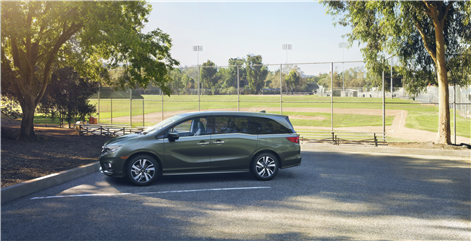 The 2018 Honda Odyssey offers a passenger compartment that can accommodate 8 passengers in comfort and a cargo space that reaches 4,000 liters when both rows of seats are lowered. With all the seats in place, the space still borders the 1,000 liters. All 2018 Honda Odyssey models come standard with dual-zone climate control, multi-angle rearview camera, heated seats, keyless entry with push-button start, Android Auto and Apple CarPlay functionalities, and Wi-Fi internet access. They also offer advanced driver assistance systems that include automatic braking and collision prevention system, foward collision warning system, lane departure warning and prevention, and adaptive cruise control. There are also airbags everywhere including for your knees. To learn more about the new 2018 Honda Odyssey, contact us today at Bruce Honda!